Rain in Dubai brought this year’s Champion County match to an early conclusion with just 19 overs bowled on day four. MCC were 265 for 4 in their second innings, with a lead of 10, when play was brought to an end. Tom Westley fell to Scott Borthwick and Warwickshire opener Dom Sibley added 26 to his overnight score of 102* before being bowled by Rikki Clarke. Clarke found himself on a hat-trick when he had Tom Abell lbw first ball. Peter Trego survived the hat-trick delivery and play was called off at the end of the following over. There were three wickets apiece for Connor McKerr and Freddie van den Burgh as MCC were 265 all out - Dan Lawrence the only man to pass fifty - in their first innings. From there Surrey’s young stars stole the show. 18-year-old Jamie Smith made a name for himself by registering the highest score by a debutant in Surrey’s history. The England Under-19 international hit 16 fours and two sixes in his 127. Smith shared a stand of 266 with Ollie Pope before being dismissed by Stuart Broad. Pope himself, who has made two Test appearances for England, proceeded to unleash a sublime 251 off 297 deliveries as Surrey racked up 520. The 21-year-old struck 23 fours and six sixes in an effort that will not have gone unnoticed by the national set-up. It wasn’t all about the Surrey brood however as Warwickshire’s Dom Sibley sent out a signal to England’s selectors in MCC’s second-innings reply. 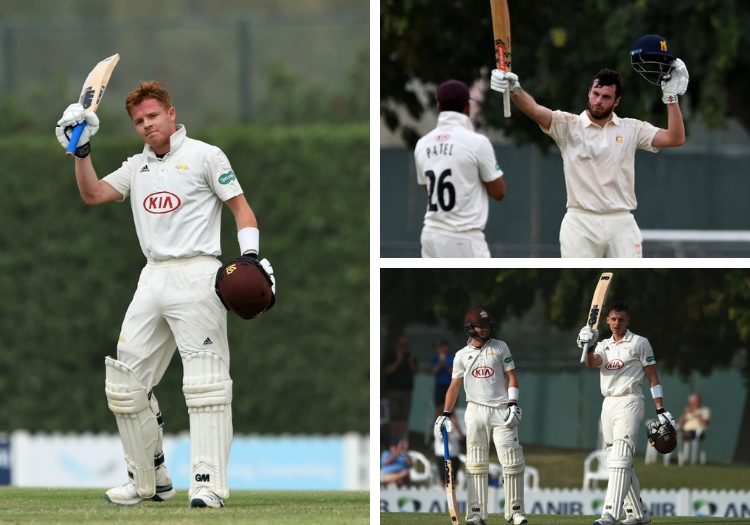 The 25-year-old batsman - who registered hundreds in the final three fixtures of last season - hit a century in his fourth consecutive first-class match, sharing a 190-run stand with Warwickshire opening partner Will Rhodes (88) as MCC batted towards a draw.